BUM CHICOO Baby Bandana Drool Bibs are made with Super soft organic cotton on the front to soak drools and dribbles and avoiding skin irritation, with back layer of ultra absorbent thick fleece to absorb more liquid and keep your baby's clothing dry, thus protecting your baby from drool rash on chin,chest and neck area. 100% organic cotton on the front layer, 100% polyester fleece at the back layer. 14 inches * 7.3 inches.Since they are individually cut by hand, the actual size of the Bib may vary from one to another. 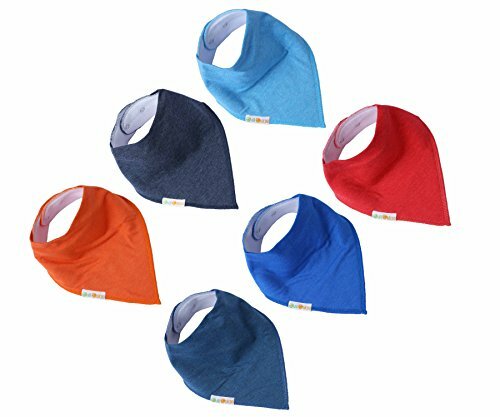 6x Attractive POP color Series Baby Bandana Drool Bibs. Wash in water before first use. Recommended to hand wash the bibs in cold water with mild detergent and lay flat to air dry. One year warranty for every purchase , 30 days money back. FEEDING MADE SIMPLER : Super Absorbent and Comfortable, double layered design, 100% organic cotton on the front layer, 100% polyester fleece at the back layer. EASY CLEAN : Best Protect for Drooling and Teething, avoiding skin irritation, reduce the work for the new mother. EASY TO USE : 3 Size Neckline Adjustable, easy to use, for 3-24 months babies. VARIATIONS: 6 Different Stylish SOLID Colors.Specially Made in INDIA with utmost Care. LIFETIME MONEY BACK GUARANTEE : Colors Wont fade after wash,100% Money Back Guarantee. If you have any questions about this product by Bum Chicoo, contact us by completing and submitting the form below. If you are looking for a specif part number, please include it with your message.